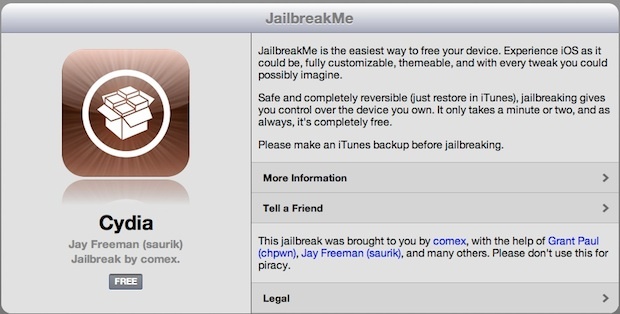 JailbreakMe 3.0 is out finally and if you’re interested in jailbreaking this is what you’ve been waiting for; it is entirely computer free, there is no DFU mode, there is no restoring firmware and IPSW files, nothing complicated at all, just load the jailbreakme.com website from your compatible iOS device and the jailbreak installs. This is the easiest jailbreak in existence and it’s the first official iPad 2 jailbreak available, but also works on all other hardware capable of running iOS 4.3.3, including iPad, iPad 2, iPhone 3GS, iPhone 4, iPod touch 3rd gen, iPod touch 4th gen.
That’s all there is to it. It’s probably a good idea to reboot the iOS device once it’s finished so everything works as intended. If you ever get sick of it, you can unjailbreak just by restoring the iOS device from iTunes. Optionally, after the jailbreak is finished you may want to search for and download “PDF Patcher 2” from the Cydia store so you can patch the exploitable PDF hole that allows the jailbreak to install in the first place. The simple installation process is identical on the iPad, iPhone, and iPod touch. Happy jailbreaking. worked like a charm, so easy! This looks like a serious security threat. Apple will undoubtedly close this hole soon. Yes, you can expect iOS 4.3.4 shortly as a security fix that will prevent the PDF exploit and jailbreakme. Try to clear your cache and cookies in Safari, remove all apps from multitasking, and reboot the iOS device. cleared cache, cookies, no apps multitasking (that i can see anyway), rebooted iphone – but still same problem. any more suggestions? ios 5 ipad 2 verizon verified works perfect! does jailbreakme only work on mac or does it work on windows? jailbreaking is for the phone, not the computer. this JB is only for iPhone, iPod touch, and iPad. What OS you’re running on your computer has as much to do with this JB as what brand of oil is in your car. Can not synchronize after jailbreak By dragging apps to my ipad. Also fails to install installous 4.
sydia install & loadingd ok.
when i try to go to jailbreakme.com from safari, it looks like the old version and gives the version too new error. Do I have to save the shsh file after the jailbroken my iphone 4? i jailbroke my ipod-touch.. but it isnt successful..
it says, THIS DEVICE IS IN THE PENDING TSS QUEUE!! That is a message from Cydia, it means the Cydia servers are busy. Just wait it out. The version of iOS on your iPad is not compatible. Someone please help!!! Trying to jailbreak my iPhone 4 but when I go to jailbreakme.com it tells me it’s not supported on my device? !